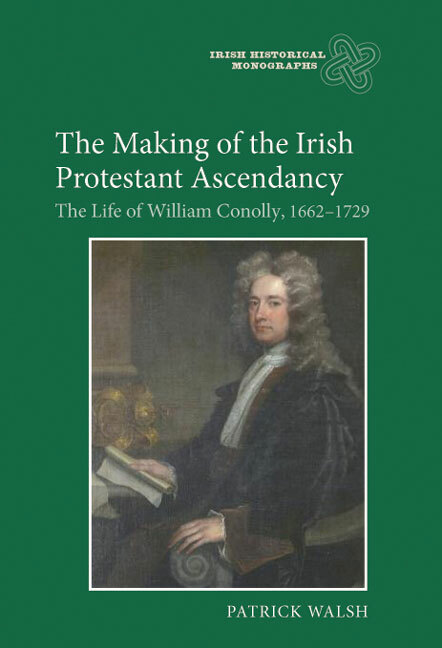 William Conolly [1662-1729] was one of the most powerful Irish political figures of his day. As a politician, in the years 1715-29 simultaneously Speaker of the Irish House of Commons, Chief Commissioner of the Revenue, Lord Justice, and Privy Councillor, he made significant contributions to the role of the Irish parliament in Irish life, to the establishment of a more efficient government bureaucracy, and to the emergence of a constructive strain of patriotism. In addition, he was a patron of architects, contributing significantly to the fashioning of Georgian Dublin, and building his own Palladian mansion at Castletown, nowadays one of the most frequently visited Irish historic properties. His rise to wealth and eminence from very humble beginnings and a Catholic background also illustrates the permeability of Irish society. Conolly's career reflects the development of the early Georgian Irish political, cultural and ideological nation, in all its complexities and contradictions. Patrick Walsh is a Postdoctoral Research Fellow in the School of Histories and Humanities, Trinity College Dublin.